Night of the Radishes | Kid Reporters' Notebook | Scholastic Inc.
Several of the radish sculptures, like this one of an ostrich, whimsically depict animals and birds. In the late 1800s, farmers in the Mexican city of Oaxaca began a tradition of carving radishes from their annual harvests into colorful sculptures. 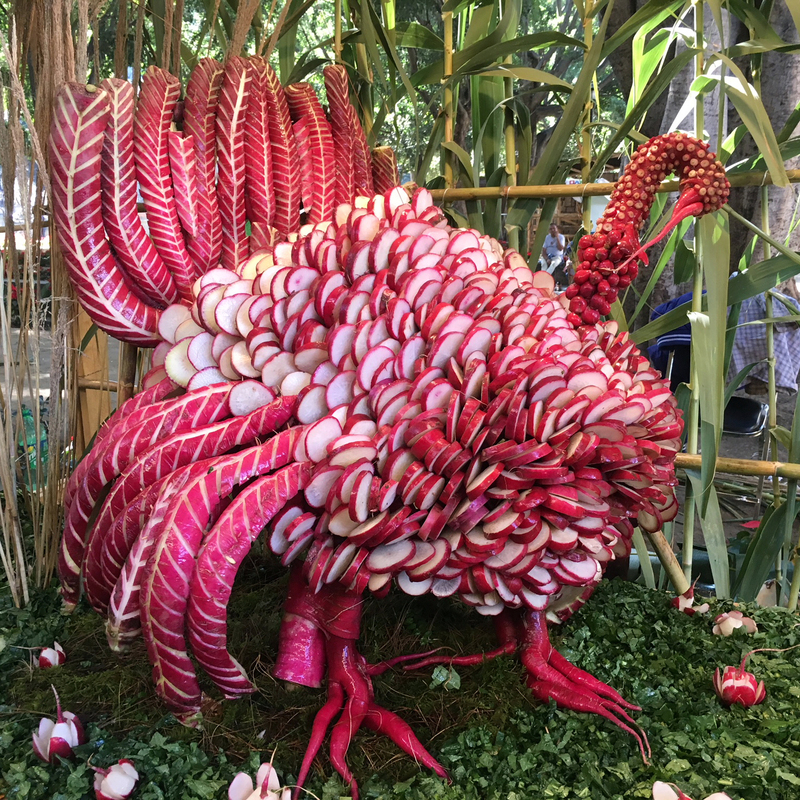 Since the late 1800s, participants young and old have entered the annual competition, crafting colorful sculptures from radishes that are displayed and judged at the market. The competition draws thousands of visitors each year. People from near and far come to admire the sculptures, which depict everyday life in Oaxaca, dragons and other figures popular in Mexican folklore, and such religious scenes as the Nativity. Corn husks and dried flowers are also used in the displays. Some entries are made from corn husks and flowers. This sculpture depicts a farmer working in the fields. Radishes, which are native to China, were introduced to Mexico by Spanish settlers centuries ago. There are strict rules surrounding the growing of the radishes for the competition, with the government providing the seeds and plots of land. The radishes are deep purple and unusually large, which helps with the carving. They are not edible, like the pink radishes one finds in a supermarket. The first seeds are planted in October. After they are harvested, participants have one day to clean the radishes and two days to carve the sculptures. Because the radishes tend to wilt, participants use water and moss to keep them fresh. On the final day, the creations are placed on the stands, ready for throngs of people to view them. Hermenegildo Contreras Cruz was one of the participants in this year’s competition, which is traditionally held on December 23. The 65-year-old said that he has been entering the contest for about 40 years. Cruz won the competition with his portrayal of a unique silent procession (La Procesión del Silencio), which is held on Good Friday each year in the Mexican state of San Luis Potosi. It is one of the country’s oldest and most important religious rituals. During the procession, participants hold aloft a flower-strewn statue of Mary, the grieving mother of Jesus. More than 160,000 visitors look on as the statue is carried through the streets of the city’s historic center. No one speaks; there is only music. For his sculpture, Cruz took home 30,000 pesos, the equivalent of about $1,500. Children who enter the radish competition are also eligible for awards. This year’s grand prize of a bicycle went to Luis Angel Gutierrez, 8. He created an Alebrije, a mythical animal from Mexican folklore.